Democrats went to Puerto Rico to discuss, fundraise for, and spread awareness about hurricane recovery, but Fox News says they were "partying in Puerto Rico" instead of "doing something in Washington"
On the morning of January 14, Fox News focused heavily on a group of over 30 Democrats, most of them members of the Congressional Hispanic Caucus, who spent the weekend in Puerto Rico as part of an annual retreat. Fox spun this trip as the Democrats partying "on the beaches" instead of working to end the government shutdown. Democrats were actually in Puerto Rico for a retreat organized by the Congressional Hispanic Caucus’ Bold PAC. According to The Hill, Bold PAC chair Tony Cárdenas said “he chose Puerto Rico for this year's convention to showcase the island's needs as it slowly recovers from 2017's Hurricane Maria.” NBC News reported that members of Congress sought to aid the island’s recovery from Hurricane Maria by bringing medical supplies and discussing the neglected recovery with Puerto Rican political leaders, including Gov. Ricardo Rosselló, San Juan Mayor Carmen Yulín Cruz, and several top legislators. Democrats also attended a performance of Hamilton, part of a special limited-time run in which creator and original star Lin-Manuel Miranda reprised his role to help raise funds for hurricane recovery. According to The Hill, Miranda said, “We brought Hamilton here to bring a spotlight to Puerto Rico” and its recovery. All Democrats who attended bought their tickets with their own money. NBC News also reported that “The Bold PAC conference was scheduled for Puerto Rico months before the shutdown” and that the group would be monitoring the shutdown and its developments. The report also noted that the congressional members would “be able to get a bird's-eye view of how the shutdown is affecting the island that is trying to pull itself out of a financial crisis while recovering with the devastation of Category 4 Hurricane Maria." While Fox News did mention that it was “a work-play trip,” most of its 19 mentions or segments about the story between 6 a.m. and noon on January 14 were intended to create an image of Democrats ducking their responsibility to help end the government shutdown (which Fox News helped start) and instead vacationing in paradise while real Americans suffer. Fox & Friends co-host Ainsley Earhardt said that “the optics are not good” for the Democrats when “there are 800,000 [federal] workers that aren’t getting paid,” but members of Congress who are “supposed to be doing something in Washington” are instead “on the beaches with their families.” Fellow co-host Brian Kilmeade also falsely claimed that CBS and NBC didn’t cover the story, when both networks covered the story online before Monday. Kilmeade also asked counselor to the president Kellyanne Conway about the White House’s reaction to “the Democrats partying in Puerto Rico rather than staying” in Washington, D.C.
Fox re-aired Trump’s highly misleading comment that “the Democrats were in Puerto Rico celebrating” the government shutdown. Hannity and his guests lie about violent rioting by pro-Trump supporters, claim it was "the left"
Since he exited the White House, President Donald Trump’s former press secretary Sean Spicer has been feted by Hollywood at the Emmy Awards, nabbed a coveted slot as a fellow at Harvard University, and started lining up high-dollar speaking gigs for business groups. But his effort to monetize the political celebrity status he acquired by famously lying to the public before it fades has hit a major snag: Unlike many of his predecessors, he has reportedly found that the major TV news organizations are unwilling to sign him to a lucrative contract as a paid contributor. Per NBC’s Claire Atkinson, CBS News, CNN, Fox News, ABC News, and NBC News have all passed on offering him a job. 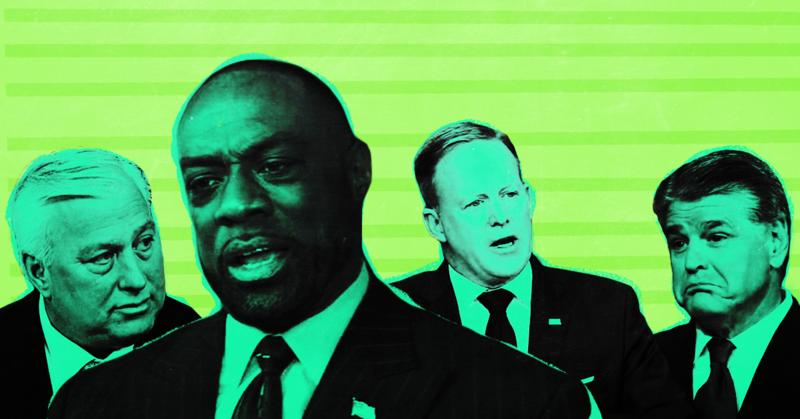 According to The Daily Beast, even the pro-Trump One America News Network isn’t interested in Spicer. The networks are reportedly unwilling to sign Spicer to a deal for the same reason he became a household name: He has no credibility after lying for the president at a near-comical rate and serving in the vanguard of the Trump administration's war on the press. And while Spicer himself continues to deny that he has a credibility problem, his first TV news interview -- on ABC’s Good Morning America today -- demolished any case for giving him a media gig. 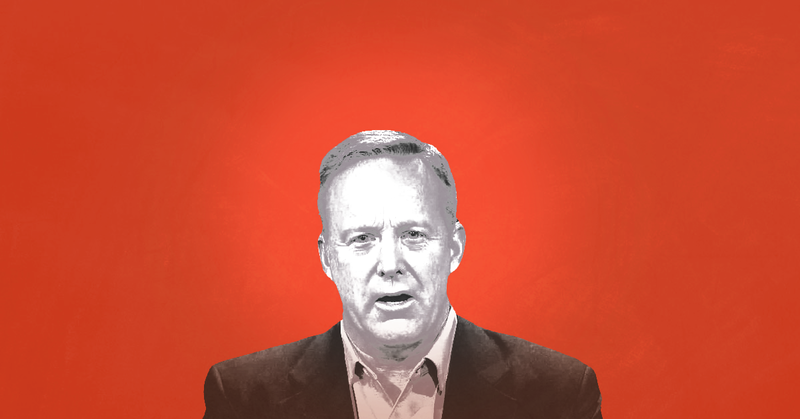 Over the course of his sit-down with Paula Faris, Spicer demonstrated an ongoing lack of candor and a refusal to take responsibility for his past actions that makes him a poor investment for a news network. Indeed, he seemed to vindicate their reported concerns, point by point. Spicer’s lack of contrition for lying from the White House podium was reportedly an issue for network executives. And on GMA, Spicer furthered this impression. As Faris ran down one falsehood after another, Spicer denied that he ever “knowingly” lied to the American people, an obvious untruth that further dismantles his credibility. Faris’ interview also opened up a new problem for Spicer’s potential employers. Spicer repeatedly refused to address questions about special counsel Robert Mueller’s investigation into the Trump White House, including whether he had hired a lawyer or been subpoenaed. Every political contributor at a broadcast or cable network is likely to be called upon for segment after segment about that investigation in the coming months. Why hire someone who can’t (or won’t) discuss it -- especially if the reason they won’t do so is for fear of their own legal jeopardy? From time to time, journalists either mock or scorn individuals who don’t seem to realize the fundamentals of reporting -- the people who seem to think journalists need to get permission to film public demonstrations, or request approval to quote from tweets. But Spicer isn’t an ignorant civilian -- he’s a political communications professional with decades of experience who recently served in the White House, and he’s threatening a reporter with legal consequences for seeking a comment. Imagine signing Spicer to a cushy network contributor gig, then needing to field requests for comment from reporters who want to know why your new hire is engaging in that sort of behavior. Thus far, media outlets appear to be doing a solid job of refusing to reward Spicer’s atrocious behavior. That’s good news. As I warned in July, treating Spicer like any other flack and offering him a media gig after he left the White House would establish a horrendous incentive structure, in which those who lie to the public and try to undermine and berate the press receive no punishment for their actions. This is a dramatic change in behavior from last year, when CNN hired former Trump campaign manager Corey Lewandowski, who was notorious for not only berating but also physically assaulting and sexually harassing journalists. For its money, the network got an unrepentant Trump shill, a series of ethical scandals, and the contempt and mockery of other journalists. Per the Beast, this PR disaster has been “instructive” for media executives “in what not to do.” I suppose the lesson is better learned late than never. But the lesson is very expensive for Spicer, who apparently will not be drawing a six-figure salary from a media outlet anytime soon. He won’t starve, of course -- there will be plenty of business groups willing to pay up to hear him speak, and no doubt he’ll be able to line up a consulting gig eventually. Then again, given the hourly rate of the white-collar lawyers White House aides have been hiring to deal with the Mueller investigation, Spicer may need every dollar he can get. 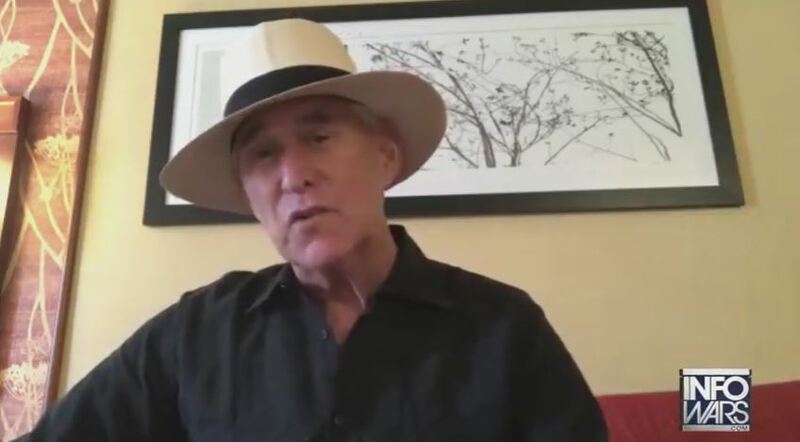 Roger Stone is doing damage control following the filing of a lawsuit alleging a scheme by Fox News and Trump administration officials -- including possibly the president himself -- to use the murder of Democratic National Committee staffer Seth Rich to absolve the Trump campaign of accusations it coordinated with Russia. NPR reported on August 1 on a defamation lawsuit filed by Fox News contributor Rod Wheeler against 21st Century Fox, Fox News, Fox News reporter Malia Zimmerman, and frequent Fox guest Ed Butowsky. Wheeler alleges that Zimmerman published fake quotations attributed to him in a since-retracted May 16 story about Rich, and that Trump administration officials, including the president himself, were involved in crafting the story. The retracted story suggested that Rich, rather than Russia, provided WikiLeaks with emails stolen from the Democratic National Committee. Former White House press secretary Sean Spicer acknowledged to NPR that he did meet with Butowsky and Wheeler prior to the story’s publication. The lawsuit also alleges that Trump himself reviewed the Zimmerman story before it ran. Rich was murdered in Washington, D.C., in July 2016 in what local police believe was a botched robbery attempt. Conspiracy theories began spreading within weeks of Rich’s death and percolated throughout fringe right-wing media for nearly a year before finally exploding into the national conversation thanks to Fox News host Sean Hannity, who continuously hyped Zimmerman’s May 16 report. During the August 1 broadcast of conspiracy theory program The Alex Jones Show, Stone, a longtime Trump adviser, said, “My sources at Fox and my sources in the White House tell me that the lawsuit filed by the black private investigator, former D.C. police officer, is completely and totally bogus.” Stone also added that he thinks the lawsuit will be quickly dismissed. Stone was one of the first prominent figures to promote conspiracy theories about Rich’s death. In recent months, Stone has turned his sights on Rich’s parents, first calling their behavior regarding the investigation into their son’s death “suspicious,” and most recently saying that Rich’s “parents should be charged with obstruction" of the investigation. A new NPR report confirms that the Trump administration met with a Republican donor and Fox News contributor Rod Wheeler about a now-debunked FoxNews.com report that pushed false claims about Seth Rich, a deceased Democratic National Committee (DNC) staffer. As reported by NPR, according to a subsequent lawsuit filed by Wheeler, the donor gave talking points about the Rich conspiracy theory not only to Wheeler but also to other Fox News employees, messaging that was then parroted on Fox & Friends and Sean Hannity’s show. Wheeler's lawsuit also alleges that President Donald Trump helped with the article in order to distract from the ongoing controversy about Trump’s possible ties to Russia. Trump, people in Trump’s inner circle, and Fox News have all previously spread fake news and downplayed and delegitimized efforts to counter the spread of fake news. In May, a Fox affiliate in Washington, D.C., claimed that Wheeler, who is a private investigator, said police had told him that they were told to stand down regarding the death of Rich, a DNC staffer killed in what law enforcement has concluded was likely a botched robbery attempt. The affiliate also said that Wheeler said it was “confirmed” that Rich had spoken to WikiLeaks, which published thousands of leaked DNC emails during the 2016 presidential campaign. FoxNews.com reporter Malia Zimmerman subsequently published an article on the site quoting Wheeler as saying, “My investigation up to this point shows there was some degree of email exchange between Seth Rich and WikiLeaks,” and, “My investigation shows someone within the D.C. government, Democratic National Committee or Clinton team is blocking the murder investigation from going forward.” According to the lawsuit, in conjunction with the FoxNews.com story, the Republican donor who brought Wheeler and Zimmerman together also suggested talking points to "various Fox News producers" and Fox & Friends on-air personalities, as well as to Wheeler for use on Hannity’s program. Both Fox News shows parroted the suggested messaging within days. But the story was quickly debunked, with Wheeler admitting he had no evidence and D.C. police saying Wheeler’s supposed claim was false. Fox News was forced to later retract the story. Yet Hannity, who ran with the report, continued to push the conspiracy theory even after the retraction. Wheeler, in an August 1 lawsuit against 21st Century Fox, Fox News, Zimmerman, and the Republican donor, investor/Trump supporter Ed Butowsky, now claims that Zimmerman made up those quotes she attributed to him. 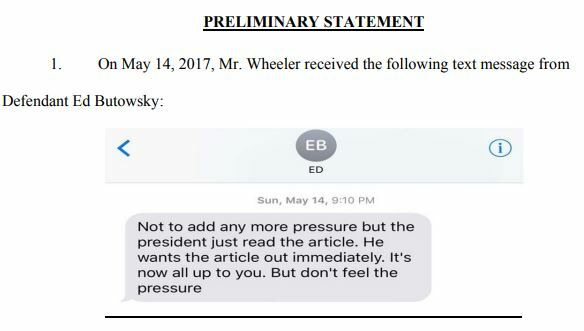 Wheeler claims that Trump was given the article in advance to review and urged its publication, and that the supposedly fabricated quotes were published “because that is the way the President wanted the article.” Wheeler added that Zimmerman and Butowsky, who bankrolled Wheeler’s original investigation into Rich’s murder, “had created fake news to advance President Trump’s agenda.” Former White House press secretary Sean Spicer -- who had said in May that he knew nothing about the story -- has now confirmed to NPR that he met with Wheeler and Butowsky to discuss the article before it was published, adding that he did not know of any involvement by Trump. April 20: Wheeler, Butowsky brief Spicer on Seth Rich. The allegations come after Trump and his inner circle have worked tirelessly to cloud the actual meaning of fake news while spreading fake news stories themselves. Trump and his aides, echoing right-wing media including Fox News, have repeatedly called legitimate news stories and outlets they do not like “fake news.” People close to Trump, including former national security adviser Michael Flynn, have pushed fake news -- as has Trump himself. Additionally, federal investigators are looking into whether Trump’s 2016 campaign digital operation, headed by Brad Parscale along with Cambridge Analytica, a data analytics firm hired by the campaign, colluded with Russia to target voters in specific states with fake news. CNN's Brian Stelter explains how new Seth Rich report shows the "connections between Fox and the White House"
Trump's press secretary spent months lying and attacking the press. Networks shouldn’t pay him to do it. UPDATE: Shortly after the publication of this post, news broke that financier Anthony Scaramucci had been forced out of his position as White House communications director, which was announced 11 days ago and scheduled to begin next month. He was reportedly escorted from the building this morning. It is currently unclear if he will take another job in the White House or the administration. In the event that he does not stay in the administration, networks shouldn't hire him, either. Outgoing White House press secretary Sean Spicer will need a new job when his tenure in the Trump administration concludes at the end of August, and he’s apparently hoping that one of the news outlets he’s spent the year berating will step up and pay him a salary. Spicer spent last Wednesday “in talks with major broadcasters about a new career in TV where he can share his insider knowledge of President Trump,” according to The New York Post, which reported that Spicer took meetings with top executives at the Manhattan headquarters of ABC, CBS, NBC, and Fox News. It has become customary in recent decades for high-ranking White House communications advisers to convert their public service into a high-paying media sinecure. Former President George W. Bush’s White House aides Dana Perino and Nicolle Wallace and President Barack Obama’s advisers Jen Psaki and Josh Earnest are among the long list to make this transition. 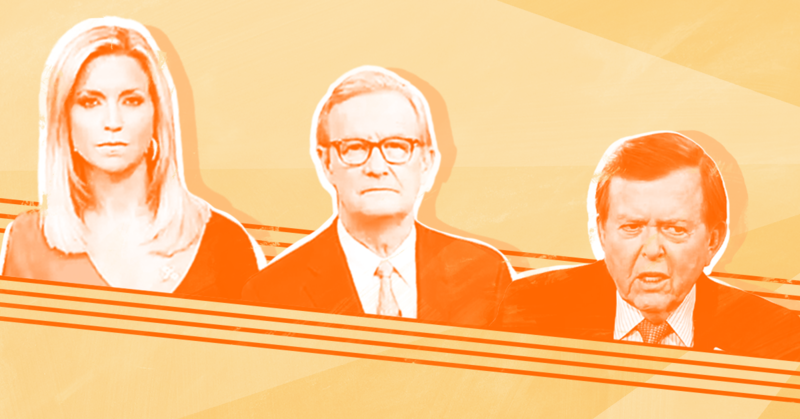 In return for their media salaries, these aides-turned-political-analysts offer network viewers an inside look at how messaging decisions are made at the highest level. But if network executives have a modicum of self-respect and the slightest sense of self-preservation, they will not offer Spicer this deal. To give the former White House press secretary a mainstream media gig would ensure that Trump’s communications aides face no punishment whatsoever for using the imprimatur of the White House to lie to and seek to undermine reporters. With that incentive structure firmly in place, there is no reason to expect that behavior to change. If networks are helpless to prevent this assault on their work, surely they can at least avoid rewarding it. President Donald Trump’s administration has been driven by a vicious, unyielding effort to destroy the credibility of journalists, setting them up as the “the opposition party” and the “enemy of the American people” in order to call their reporting into question. Spicer could have used his position to provide some space from the administration’s vitriol. Instead, he was an unapologetic leader in this campaign, regularly denouncing journalists for producing “fake news.” Spicer reportedly had a “strong antipathy toward both political journalism as a craft, and political journalists as a class of people” long before he joined the administration. There is no reason to think he would halt those attacks once he received a network salary, and indeed, that platform might make his attacks ever more potent. Why would a credible media outlet hire someone who holds journalism in contempt? Trump constantly tells lies, great and small, creating an immense challenge for journalists who have to sift through his statements and compare them to reality. 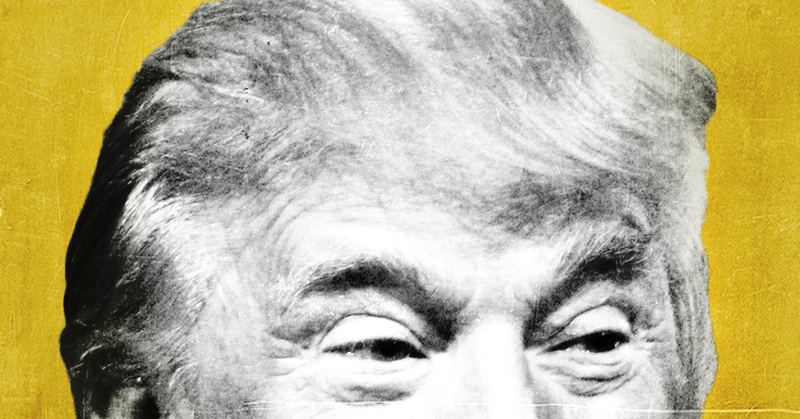 In turn, Trump’s obviously false statements regularly puts his aides to the test, forcing them to decide whether they are willing to stand by those lies. But Spicer never seemed to have a problem choosing between Trump and the truth -- he was willing to say literally anything, no matter how absurd, in order to defend Trump. There is no reason to think that he wouldn’t do the same on air if a network put him on its payroll. Why would a credible media outlet hire someone who doesn’t clear even the lowest possible bar for truth-telling? Network executives who may be tempted to think that Spicer offers them more in value than they’d lose in credibility should take heed of the humiliation CNN put itself through last year. The network hired Corey Lewandowski shortly after he was fired from his post as Trump’s campaign manager, in spite of Lewandowski’s notoriety for verbal assaults and physical altercations with journalists. For all intents and purposes, Trump found a way to give Lewandowski a raise at the network’s expense, as the former aide continued to advise the candidate, travel with him, receive hefty “severance” checks from the campaign, and use his on-air time to defend every indefensible Trump action. After network head Jeff Zucker repeatedly defended the move while sustaining months of criticism from journalists of all stripes, CNN suffered the final indignity when Lewandowski resigned, seeking a job in the administration. CNN, which has experienced the most hostile attacks from the Trump administration of them all, is notably the only network to publicly say it is not interested in hiring Spicer. According to network host Brian Stelter, the decision is a deliberate response to “those anti-media attacks, the criticism of CNN and other outlets, all of the sort of inaccurate and false statements from the podium.” If CNN has truly learned its lesson -- and I am somewhat skeptical of a network that retains Jason Miller, Jeffrey Lord, and Kayleigh McEnany as on-air pro-Trump shills -- that’s a good sign. Networks seeking to maintain their credibility in the face of a White House assault on the press without recent precedent should pass on Spicer. If he’s going to get a media payday, let it be from Rupert Murdoch’s Fox News. That network’s hosts and analysts regularly defend whatever the president says, and for decades they’ve sought to undermine the rest of the press for their own benefit. Spicer can have a seat on Fox & Friends’ curvy couch in the morning and do hits on Sean Hannity’s show at night. He’ll fit right in. 1. He refused to commit to the return of regular on-camera press briefings. KARL: There's been a question about credibility, some things that have been said in this room. Let me ask you a variation of what I asked Sean Spicer on his first day. Is it your commitment to, to the best of your ability, give accurate information and truth from that podium? SCARAMUCCI: I sort of feel like I don't even have to answer that question. I hope you can feel that from me, just from my body language, that's the kind of person I am. I'm going to do the best I can. 3. He deflected from a question about the Russia investigation by bragging about President Trump's supposed sports abilities. SARA MURRAY: Obviously we know the president has been feeling under siege with the Russia investigation, both from the Department of Justice but also on the Hill. Do you feel like he was feeling exposed? He didn't have people adequately coming to his defense? Is that part of the reason that we have you here today? SCARAMUCCI: No, I don’t think so. So, one of the things that I’m doing today is – I sort of didn’t have my White House counsel briefing before I'm having the press briefing, so I want to limit my remarks related to the Russia situation and things like that. But here's what I'll tell you about the president: he's the most competitive person I've ever met, OK? I’ve seen this guy throw a dead spiral through a tire. I've seen him at Madison Square Garden with a topcoat on, he's standing in the key and he's hitting foul shots and swishing them, OK? He sinks three-foot putts. I don't see this guy as a guy that's ever under siege. This is a very, very competitive person. Obviously there's a lot of incoming that comes into the White House, but the president’s a winner, OK, and what we're going to do is we're going to do a lot of winning. 4. He said “I sort of don’t like the fake news,” and claimed “there feels like there’s a little bit of media bias” out there. MURRAY: One other question, in terms of the relationship that this press operation has had with news outlets, they've made a habit of calling these outlets they don't like "fake news," calling stories they don't like "fake news," calling errors that were then corrected -- using that as an example to call entire news outlets "fake news," is that the kind of relationship you want with media outlets? What kind of -- how do you envision that relationship? SCARAMUCCI: Again, I will speak for myself right now, because I don't -- it's my first day on the job, I've got to get familiar with everybody, get direction from the president, but I had a personal incident with your news organization and I thought I handled it well. You guys said something about me that was totally unfair and untrue, you retracted it and issued me an apology, and I accepted the apology immediately. For me, I've never been a journalist, but I have played a journalist on television. I used to host Wall Street Week for Fox Business, so I have empathy for journalists in terms of sometimes they're going to get stories wrong. But I sort of don't like the fake news, and if you said to me that there is some media bias out there – if you want me to be as candid as I would like to be with you guys -- there feels like there's a little bit of media bias, and so what we hope we can do is de-escalate that and turn that around and let’s let the message from the president get out there to the American people. 5. He claimed there's "probably some level of truth" to the lie that millions of people voted illegally in the 2016 general election "if the president says it." REPORTER: Do you stand by some of the factual claims that have been contested, that have been made by this administration -- three million illegal votes cast for the president's opponent? Do you now, do you endorse all of those statements of fact [inaudible]? SCARAMUCCI: So, a little bit of an unfair question because I'm not up to speed on all of that, so I just got to candidly tell you that. REPORTER: The president said that three million people voted illegally and there is no evidence of that. Do you stand by that or not? SCARAMUCCI: OK, so if the president says it, OK, let me do more research on it. My guess is that there's probably some level of truth to that. I think what we have found sometimes, the president says stuff, some of you guys in the media think it's not true or isn't true, and it turns out it is closer to the truth than people think. So let me do more homework on that and I'll get back to you.